Those of you who are already feeling the intensities of Holy Week may appreciate this quick diversion, courtesy of my newly revived blog (but nevertheless quite relevant to the Catholic culture subforum). Glad to see that knee-breeches have a place in the new liturgical movement. 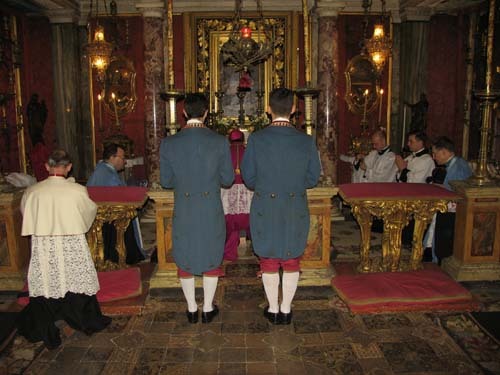 Spotted this photo, among others, on the New Liturgical Movement's blog of a low Mass in the Extraordinary Form/TLM celebrated by Archbishop Raymond Burke (formerly of St. Louis, now Prefect of the Apostolic Signatura) and the ICRSS (Institute of Christ the King Sovereign Priest) in Rome at the Palazzo Massimo. This liturgy is celebrated every year in honour of a miracle by St. Philip Neri who, on the 16th of March, 1583, raised 14-year old Prince Paul Massimo from the dead. 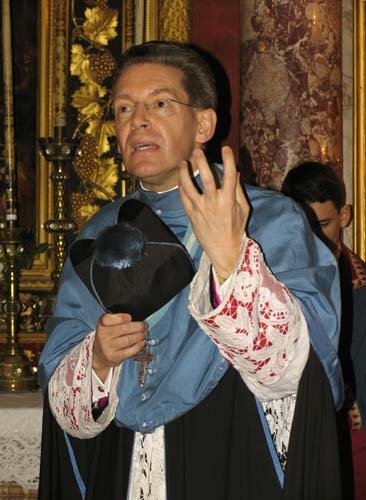 Also note the blue mozetta (a shoulder cape which is worn as part of choir dress by bishops, abbots, canons, etc. ), which was a colour of choice for bishops during the Baroque era. 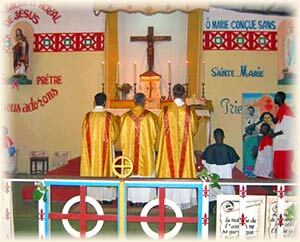 RELATED: the ICRSS in my hometown of beautiful Kansas City will be switching to the cassock & surplice style typical of the ICRSS parishes in Europe for the altar boys. They will have the institute-blue cassocks, white surplice and the institute-blue mozetta. For other Instutite goers-- do your chapels use this style of choir dress for the altar boys, or do they use the standard Black-and-Whites? Is blue a permissible colour for a bishop for any reason; or only specifically as "choir-dress?" The ICRSS Canons and Oblates can be conferred a blue choir dress as a sign of the Institutes consecration to Our Lady. "Institute of Christ the King Sovereign Priest - More Baroque than a dead-beat dad on Wallstreet." WanderingPenitent Wrote: "Institute of Christ the King Sovereign Priest - More Baroque than a dead-beat dad on Wallstreet." Clever joking aside, that's not really accurate. Does the Institute have a preference for the baroque style?Beauty is the outward expression of truth's perfection. Although the richness of the baroque style admirably expresses the sublimity of the divine truths of our Faith, there are also other artistic styles which, each in their own way, contribute to give us a little glimpse of the heavenly beauty of the eternal Truth. 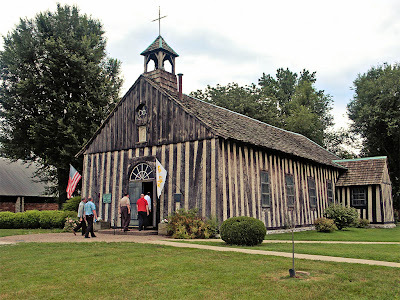 For example, the Institute's church in Wausau, Wisconsin, Saint Mary's Oratory, which enshrines a beautiful statue of the Virgin and Child which dates back to the 1470's, has undergone complete restoration in an authentic Gothic style. 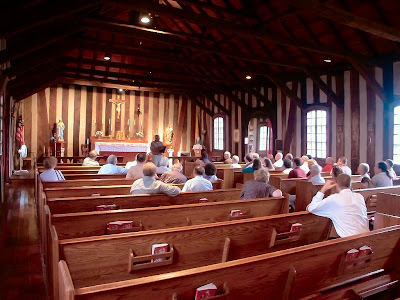 The Oratory of Saint Francis de Sales in St. Louis is a very remarkable representation of Neo-Gothic splendor, while the recently restored Old Saint Patrick's Oratory in Kansas City, Missouri, is a fine example of late-period Classical style and architecture. Their chapel in West Orange, NJ actually looks like a (crappy) modern architecture building. We just have the black and white here, for the servers. And the surplices are all different, which makes me think they were donated. And THK, you posted Monsignor Schmitz, I love him. He's gone so much though, and he won't be back here until May.